We are proud to announce that our dining hall The Caf has earned the first 3 star SPE Certification at a Canadian university! SPE Certified stands for Sanitas per Escam, or “Health Through Food” in Latin. This unique third-party certification recognizes the commitment of Carleton Dining Services to nutrition, sustainability and to our customer’s well-being! 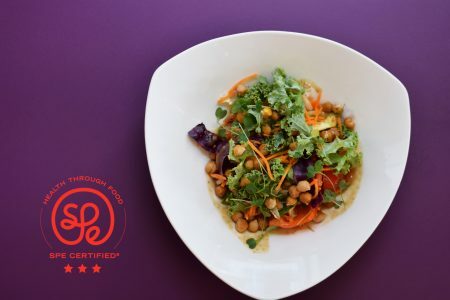 SPE’s seal of approval reassures students, faculty and staff at Carleton that meals are created while considering sustainable sourcing of ingredients, healthy culinary techniques, and balanced menu options. Just like Fair Trade Certification is for coffee and LEED Certification is for buildings, SPE certification is for food! Our Registered Dietitians worked closely with SPE’s culinary nutritionist to answer over 350 scientifically-grounded questions about The Caf’s operational practices across three key areas: sourcing and sustainability, nutrition and menu balance, and training and transparency. What does the above SPE criteria mean for a student who walks into The Caf looking for a healthy meal? It means that they’ll have a variety of balanced options available to them across stations in the dining hall at breakfast, lunch and dinner. For example, a student may be able to pair sustainably sourced cod from our Farmer’s Market station with a whole-grain quinoa dish from our Vegan station and top it off with a local red beet salad at the Salad Station. The end result is a delicious, balanced meal that has been seasonal, locally and sustainably sourced while using cooking techniques that preserve the integrity and nutritional quality of ingredients. 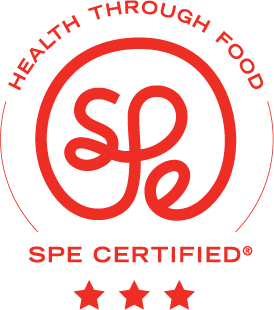 Look for our SPE Certified logo for a visual reassurance that we are committed to your health and well-being and believe in Health Through Food! Learn more at www.SPEcertified.com.